We used to associate Zotac with Nvidia GeForce graphics cards, but the company now offers far more than just GPUs. Indeed, at CES 2016, GeForce took a back seat as the firm showcased an array of new products, including mini PCs, high-performance SSDs and liquid-cooling water blocks. In the mini PC arena, there's a revamped Zbox Pico outfitted with an Intel Cherry Trail X7 processor, 2GB of memory and 32GB of eMMC storage. Moving up in size is a passively cooled Zbox C Series armed with an Intel Core i5-6300U processor and HD 520 graphics. 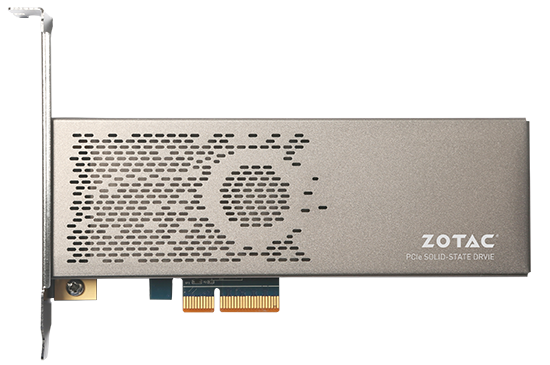 Having dabbled with mid-range SSDs in the past, Zotac is also stepping up its efforts with premium solutions utilising a PCIe 3.0 x4 interface. The above-pictured NVMe SSD is said to employ a Phison controller and Toshiba NAND memory; a combination that Zotac reckons makes this drive "a little better" than the Intel 750. Last but not least, there's a prototype of an in-house-designed water block for the GeForce GTX 980 Ti. Made of clear acrylic and outfitted with integrated LEDs, the water block isn't short of wow factor and is expected to launch in the months ahead.